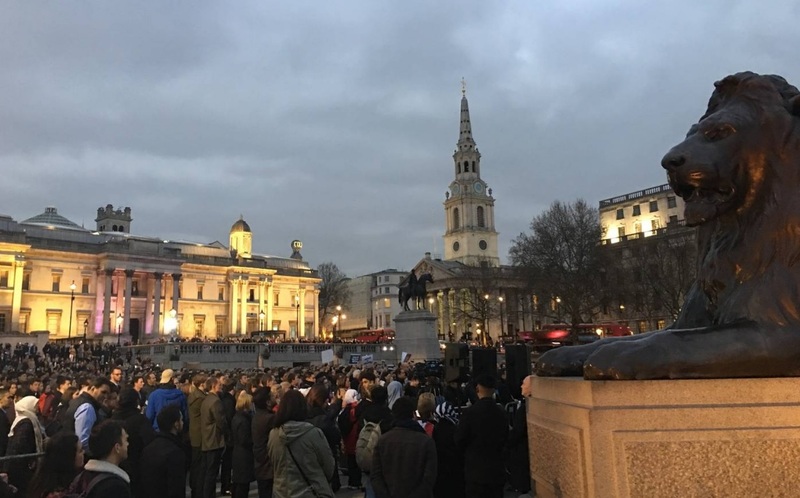 Hundreds of Kiwis have gathered in London's Trafalgar Square to pay tribute to those killed in the Christchurch mosque shootings. On Thursday evening (local time) a peace vigil got under way to remember those who died at their places of worship and to offer a symbol of solidarity with the global Muslim community. The vigil; "Stand for Solidarity with New Zealand" takes place a week on from when a lone gunman opened fire at the Al Noor Mosque and the Linwood Islamic Centre. He killed 50 people - the youngest 3-year-old Mucad Ibrahim - and injured dozens more in the attack on March 15. Hundreds filled Trafalgar square, holding banners of peace and bouquet of flowers as the vigil got under way. As the sun began to shine official proceedings began with the solemn sound of a horn being blown. A message from the Christchurch Mayor Lianne Dalziel was read out at the opening of the vigil. "What happened last Friday will never define us..what has happened since the love and outpouring that's what defines us. NZ High Commissioner to the United Kingdom Sir Jerry Mateparae followed and similarly expressed his gratitude for the support from the London community. He said the terror attacks were unprecedented and that New Zealand as a nation stood against such violent intolerance. "We have no tolerance for violence and extremism and we utterly reject them. He said New Zealand's diversity was its strength. "An attack on one of our communities is an attack on all of us." As part of the ceremony prayers from both the Christian and Muslim traditions were heard. 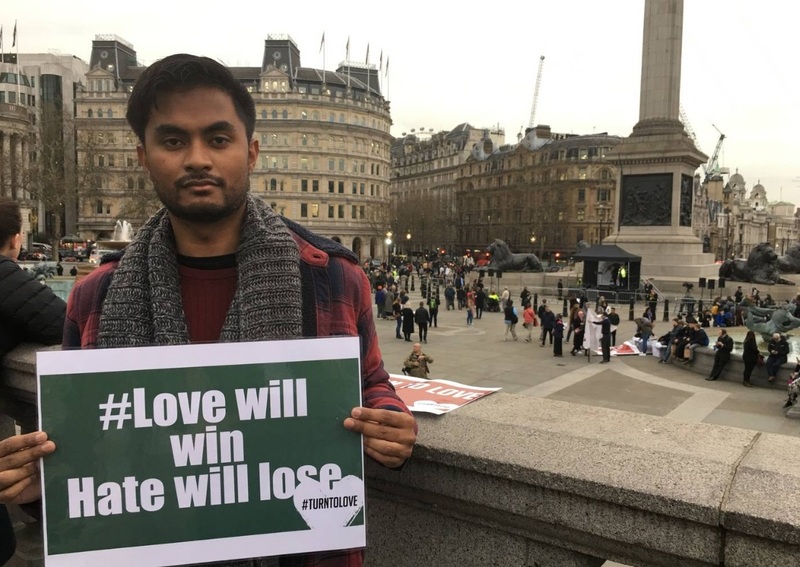 A member of the London Muslim community first thanked New Zealand as a nation for "championing humanity" before leading the call to prayer. He followed this with a list of all fifty who lost their lives in the terror attack. A minute of silence was then held in their memory before New Zealand's National Anthem was sung. Event spokeswoman Tania Bearsley said watching the tragedy unfold had made her feel the many kilometres that separated New Zealand from the United Kingdom more keenly. "Humanity hurts at moments like these." But even as she felt "immense grief", Bearsley said she also felt filled with pride as she watched the nation's response to the attacks. "There has been a great outpouring of love from New Zealand." Bearsley said, like many Kiwis who called London home, she had lived through terror events in the United Kingdom. She said she understood the pain many would be feeling, but could only offer her condolences to those who'd lost a loved one. "Tonight will be our response to the global events that have happened," she said. "We want to show the community of Muslims who are in the UK that we are here for them." A public Facebook page set up for the event showed more than 800 planned to attend the vigil with more than 1000 indicating their interest. Among those who planned to attend were members from at least 19 Kiwi groups based in London, officials from the New Zealand High Commission and the wider community in the British capital. Leaders from various faith groups led the crowd in prayer and the Ngāti Rānana London Māori Club led a karakia and waiata. Organisers also asked attendees to spread the #turntolove to create a chain with the message "they won't divide us". Bearsley said out of the tragedy had grown a strong sense of a connected community. "How lucky are we that we can come together...this is about humanity not just New Zealand." Qayum Mannan was one of those attending the vigil. He's a London native who volunteers for an organisation that seeks to share the #turntolove message. He woke up, like many in London, horrified to hear the news of a mass shooting in New Zealand. "A hateful terrorist comittee an atrocity and took away fifty people's lives. "It destroyed the world of fifty people's families." But Mannan wanted people respond to the tragedy in a more peaceful manner. "If you create an environment where both sides are pitching against each other it's moot. "If we don't stand against [terror] in solidarity we are going down a dark path."